I love my mother-tongue- Bangla (forgive me for not calling it Bengali! ), and I take a lot of pride in being a Bangali. The best thing about knowing Bangla is that it isn't really a very common language. I love being able to converse freely, in Bangla, about any topic in the middle of a crowded public place whenever I go abroad. Can you imagine the joys of being able to gossip freely, in a bus or subway train, about all the unusual passengers? It is hard for me to imagine why anyone, who knows Bangla, would choose to talk in any other language. Having attended an English-Medium school, all my life, I was forced to talk in English at school. I was never really good at Bangla and it would be fair to say that it was probably my worst subject throughout my school years. Despite all my failed exams and desperate struggles to grasp the grammatical concepts of the language, I fell in love with the language. Naturally, it really annoys me whenever I hear someone distorting the language. Consider, for example, a TV program I was watching the other day. It was a musical show featuring some relatively unknown bands. I was horrified to discover that not only did they not have any musical talents, they were completely ruining the language. It was almost like hearing a British trying to talk in Bangla! Such blatant abuse of the language is simply outrageous. Where do these people get their silly accents? The other day, at a fast food joint, I was surprised to hear a seven year old talking to his parents in English. Talking in English at school is quite justified, since it is important for children to learn good English. But I really cannot understand the reason why parents would encourage their children to talk in English outside school. These children will grow up with very little knowledge or love for their mother-tongue. But can you really blame them? Many teenagers, nowadays, prefer not to speak in Bangla. Some even proclaim it to be "uncool". I must confess, at the risk of sounding like a hypocrite, that I have never been interested in many aspects of my language. I was never really interested in Bangla books and only read those that were forced upon me at school. I like Bangla songs, but I would prefer a Beatles song over any Rabindra Sangeet. My Bangla writing skill leaves a lot to be desired. Yet, I have come to appreciate the joys of being able to speak in Bangla. I am proud of my Bangla heritage and I am grateful for simply being able to talk in Bangla. According to poet Sufia Kamal, when a human being is born on the soil of a country and thrives within the environment of that country his mind gets food for thought from the environs of that country. His mind expresses itself through the literature, art and culture of that country. So first we have to know the language, literature and culture of a country. One has to know his language, his culture and his literature, things that are the basic elements of his nationality. Let us today dip our minds a little bit into the history of Bengali language and literature. You might know that Chorjapod the most ancient evidence of Bengali literature, a two thousand-year old anthology of poetry, which was found from the library of the Royal Court of Nepal. In the ancient times the Buddhist Emperors of the Pal Dynasty patronized Bengali. But in the successive periods Bengali language had to survive the reigns of the strictly Brahmin Sen Dynasty. I said 'survived' because as a language of 'prakrito jon' or the common people Bengali had to bear the pressure of Sanskrit, the royal language of that time. The Sen Emperors were keen to use Sanskrit as the language of the scriptures and literature. As a result Bengali was banished from the Royal Court. Bengali was banned as a language of the scriptures by a Royal Decree. But the popular language flourished among the common people. After the Sen period, Bengali flourished in the reign of the Sultani period. In the Sultani period the rulers were sultans of Turkish origin but they were the greatest patrons of Bengali language and literature. The sultans of the Ilias Shahi and Hossain Shahi dynasties were very eager for the development of Bengali language. At this time under the patronization of the Sultans and their high officials many books including Mahabharat, Ramayan and Bhagabatgeeta were translated into Bengali from Sanskrit. As Bengali was the language of the common people when these were translated into Bengali the general populace was able to fathom the contents of the great holy books. Along with Sanskrit, Bengali became the language of the literature. Sultan Borbok Shah, Sultan Hossain Shah and Sultan Ghiasuddin Azam Shah were patrons of Bengali literature. It is said that the Turkish reign in Bengal was a boon for the Bengali literature. However, the Pakistani period that followed, was just a facsimile of the Sen period. According to the Abdul Karim Shahitto Bisharod if the ruling class tries to ruin the language of the nation then they cannot remain in power for long. Soon after the termination of the British Raj the Pakistan Government tried abolish Bengali from the administrative language and to impose Urdu on us. Bizarre proposals like writing Bengali in the Arabic and Urdu scripts were presented to the Bengali populace. These unwanted pressures on our mother tongue led to the Language Movement of 1952. We all know what happened on the 21st February so I will not reiterate. What we always have to know is that our language is an ancient one. It is not easy to erase a language that is two thousand years old. The apathetic Pakistani rulers forgot this but in the end they had to concede the truth and they had to accept Bengali as the state language of Pakistan. 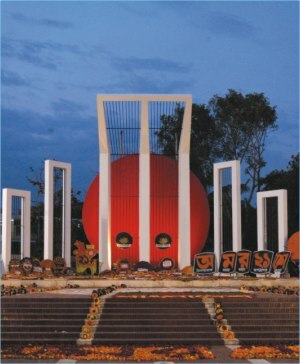 Here lies the spirit of Ekushey.